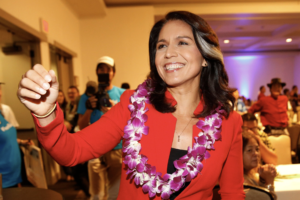 Tulsi Gabbard–a supporter of Modi, Sisi, & Assad as well as an ardent Islamophobe with ties to Hindutva nationalists, anti-Semites, & homophobes–has declared her candidacy for US president as a Democrat. In so many ways she perfectly represents that current in politics that united fascists, Stalinists, libertarians, anti-Semites, Islamophobes, & confusionists behind the dictatorship of Assad. She of course must be opposed & denounced for her hateful ideologies. 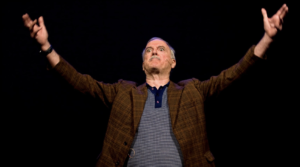 British comedian John Cleese, who has previously appeared in an Israeli film & an ad for chocolate-hazelnut spread, is scheduled to perform a stand-up comedy show in Tel Aviv this coming September. He is certainly aware of the cultural boycott against Israel but must require a remedial education in apartheid. 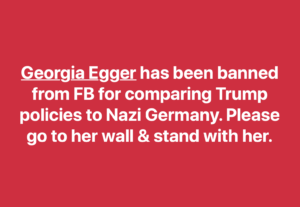 Until a BDS appeal is set up on FB, we can begin that education on his FB wall. It isn’t overstatement to say there is a new Cold War involving war, occupation, genocide against Muslims. It must be fiercely opposed in the interests of freedom of religion & democracy for all. To honor the lionhearted stone pelters of Palestine & Kashmir is not to glorify violence but to respect self-defense against violence. The oppressed have a right to defend themselves by any means necessary. The stone is the weapon of Intifada & those who condemn it, condemn Intifada against occupation. Stones are not the weapons of terrorists. Terrorists use assault rifles, drones, missiles, & explosives sold to them by Russian, US, European, Chinese, & Israeli weapons companies in a $400 billion a year industry. Terrorists use the same weapons from the same companies as the armies waging wars. 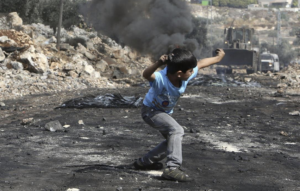 Stones are the weapons of the oppressed, of the unarmed, of the defenseless against those armed with assault rifles, pellet guns, tear gas, canisters, missiles, explosives, & bombers. 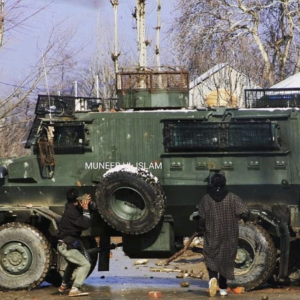 What should the stone pelters to instead? Let themselves & fellow protesters be shot at, blinded, disabled, killed without defending themselves? Stop opposing occupation? Accept colonialism? To show the relationship of forces between the stone pelters & the armies of occupation: the photo on top by Abed Omar is a Palestinian stone pelter going up against an armored wheel loader engaged in house demolitions in the West Bank. The photo is from a protest in 2014 near the Zionist settlement of Qadomem. 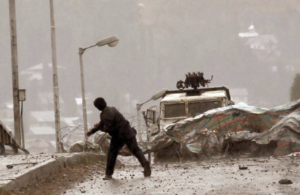 The photo on the bottom by Showkat Nanda is a Kashmiri boy facing off with stones against an Indian army tank in 2009. Nanda described how Indian paramilitary forces were shooting at unarmed protesters in the town of Baramulla. Young boys carried the body of an injured boy shot in the chest away from the scene as he died. As gunfire continued, this small boy came running “as if from nowhere” toward the paramilitaries to stand defiant & fearless against an Indian armored vehicle. Stand in solidarity with Palestinians & Kashmiris. Demand an end to the occupations. These are Kashmiri protesters responding to Indian occupying forces entering the village of Sugan in the Shopian district with guns blazing to interrupt the funeral prayers of a militant. You see this same kind of fearlessness & fury among Palestinians resisting Israeli military occupation. It is such commitment to freedom as shown by Palestinians & Kashmiris that gives hope to all of suffering humanity & it is not just our human duty but the survival instinct that dictates fullest solidarity with their struggles. 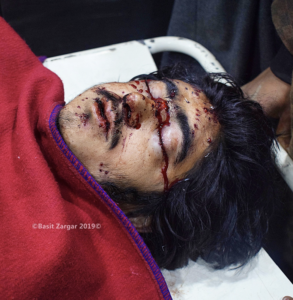 This young man is a civilian from the village of Sugan in the Shopian district of Kashmir. These are the injuries he sustained when Indian occupying forces entered his village during the funeral prayers of a militant & started shooting with bullets & pellet guns. 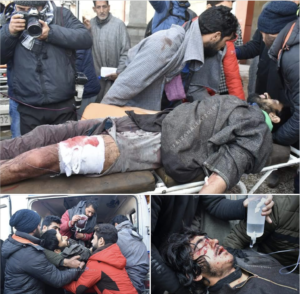 Photos of how the Indian occupying army commemorated National Youth Day yesterday in Pulwama, Kashmir: five young boys were also injured by bullet & pellet guns in Shopian when the occupying army entered a village during a funeral & opened fire. Contrary to misogynist mythology, prostitution is not the oldest profession for women. Farming is. 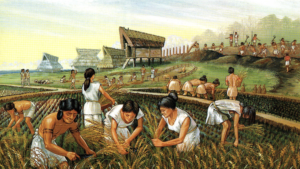 Women developed agriculture. Now it’s accepted & promoted by far too many that prostitution is just another way for women to earn a living. But it remains today what it has been since its origins: the sexual exploitation of poor women & children. It is the commodification of women’s & children’s bodies. It’s one thing to make a commodity of oil, gold, soybeans, corn. It is quite another to make a commodity of the bodies & souls of women & children. You can call us SWERF if you like. But we think there is nothing lower than justifying the sale of women & children for abuse, degradation, humiliation, violence, & often death & calling it just another way to earn a living.